CTET Answer Key 2018 Paper 1 Set L – The CTET Answer Key 2018 Paper 1 Set L has been released now. CBSE has released the CTET Official Answer Key at ctet.nic.in. The candidates who have appeared in the exam can check it via roll number and Date of Birth. CBSE has conducted Paper 1 for CTET 2018 on December 09, 2018. The candidates can use the CTET 2018 Answer Key Paper 1 Set L and cross-check their answers. With the help of the CTET Answer Key 2018. the candidates can calculate the probable score, which they shall obtain in the examination. The result for CTET 2018 will be available for check 06 weeks before the test date. The candidates can check complete details about CTET Answer Key 2018 Paper 1 Set L from this page. 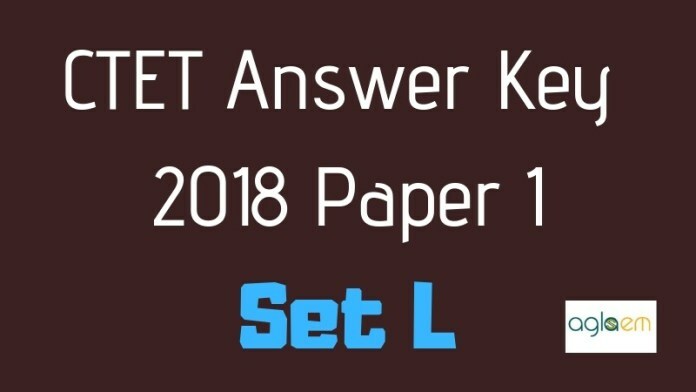 Latest: CTET Paper 1 Answer Key 2018 for Set L has been released and is available on this page. The link to download the OMR sheet and object the CTET Answer key is provided on the page. The candidates who have appeared in the examination can download their OMR Sheet through the provided link. Click here to download the CTET OMR Sheet. In CTET 2018, a candidate was given the option to appear for either Paper 1 or Paper 2 or even for both the papers. CTET 2018 Paper 1 was conducted in 20 languages in pen and paper-based mode. Candidates had to be attempt multiple choice questions from each of the 5 sections, carrying 30 questions for 30 marks. The duration of CTET 2018 Paper 1 was two and a half hours. The below schedule has been provided for candidates to keep a track of CTET Answer Key 2018 Paper 1 Set L related events. So, check the same! How To Download CTET Answer Key 2018 Paper 1 Set L? CTET Answer Key 2018 Paper 1 has also been made available on this page. Candidates can view or download the CTET Answer Key 2018 Paper 1 Set L in the following manner. Over the main page itself, a candidate will find the “Download CTET Answer key 2018” link. Click that! Candidates will be then asked to log in with their credentials to their CTET 2018 application portal. On logging in, a candidate will find the CTET 2018 question paper and set L, they had appeared for. Open the link and start estimating your CTET 2018 scores with the help of the answer key and the marking scheme released. It is said that it will be made available only for a stipulated time period. So, make sure that a candidate follows these steps and starts crosschecking their responses within this period. Central Board of Secondary Education (CBSE) will be releasing the official CTET Answer Key 2018 over its official website i.e www.ctet.nic.in. It is called as the official CTET Answer key 2018 because it is released by the official exam conducting body. With the help of this answer key and the marking scheme, a candidate will be able to estimate their exact scores. Not only CBSE provides this answer key, but it accepts any objections raised by a candidate. The official CTET Answer keys are considered to be more authentic, than the ones released by the unofficial trusted sources. Having a CTET 2018 answer key will not be sufficient to calculate the scores obtained by a candidate. Furthermore, a candidate will also be required to familiarize oneself with the exam pattern and the marking scheme. Below, we have mentioned the exam pattern for CTET 2018 Paper 1. Candidates can have a look at it and start estimating! Medium of Language 20 – English, Hindi, Assamese, Bengali, Garo, Gujarati, Kannada, Khasi, Malayam, Manipuri, Marathi, Mizo, Nepali, Oriya, Punjabi, Sanskrit, Tamil, Telugu, Tibetan, and Urdu. Exception – Additional 50 minutes will be given to differently abled candidates. How to Calculate CTET Paper 1 2018 Scores? Above we have mentioned the CTET 2018 marking scheme, with the help of it a candidate can follow these steps. Download CTET Answer Key 2018 Paper 1 Set L and keep your question paper, handy to refer. Start crosschecking the responses, that you had made. Put a cross mark in front of the incorrect responses and a tick mark in front of the correct responses. For all the correct responses, mark yourself 1 mark each. After evaluating every response, start totaling how many responses, you have got right. You can refer to this formula while estimating your CTET 2018 Paper 1 score. Hurray! You have successfully calculated your CTET 2018 Scores with the help of the answer keys and the marking scheme released. Prior to CTET 2018 Result declaration date, a candidate tends to get anxious thinking about whether or not they will be qualifying for the CTET 2018 exam. To avoid this feeling, CBSE and other trusted coaching institutes try to help out the candidates by releasing CTET 2018 Answer keys. With the help of these answer keys, a candidate will not be able to know their exact scores but just the estimation. In simple words, their chances for qualifying in CTET 2018 and starting their career as a teacher. Candidate necessarily needs to meet 60% cut off marks requirement to qualify for this eligibility test. Prior to the conducting body (i.e CBSE) releasing the CTET Answer Key 2018, several reputed coaching institutes release the CTET 2018 Answer key. As these answer keys are not released by the official bodies, these are to be treated as the unofficial CTET Answer Key 2018. These coaching institutes once they get hold of the CTET 2018 question paper sets, solve each of these sets and release the answer key, as what in their opinion should be the correct responses. The unofficial CTET answer key is released just a few hours later the exam has been conducted. The unofficial CTET 2018 answer key is also made available in 4 sets. Candidates can have a look at the unofficial CTET Answer key 2018 from this page! Soon after the CTET 2018 answer key has been released, CBSE will be announcing the CTET 2018 Results shortly. The result declaration date has not yet been declared. But initially, it was said that it will be released 6 weeks after the CTET 2018 has been conducted. So, we can expect the CTET 2018 Result to be announced in the month of January. The minimum CTET cut off marks has been fixed at 60%. The candidates who had appeared for CTET 2018 will be able to view their results in only online mode over its official website. Selected candidates will be eligible to seek admission to any of the central government schools, unaided private schools, and state government schools within 7 years from the date of issuance of the qualifying certificate. Central Teacher Eligibility Test, also known as CTET is conducted for selecting suitable candidates as teachers in government schools from Class 1 to Class 8. It conducts 2 papers, both of which is conducted for 2.5-hour duration. While Paper 1 is conducted for Class 1 to Class 5 teacher level, Paper 2 is conducted for Class 6 to Class 8 level. Every year, CTET is conducted in offline mode. The CTET 2018 Scorecard or Result is said to valid for 7 years from the date of result declaration.